John Emil, an accomplished singer/songwriter, guitarist, and a master of slide guitar, has delivered show stopping performances at major music festivals like the Telluride Blues and Brews Fest, the Leek Blues & Americana Festival UK, the Florida Folk Festival, the Decatur Blues and Bluegrass Festival, the Bangor On Dee Blues Festival UK and the 2012 Zoetemeer Blues Festival in the Netherlands. 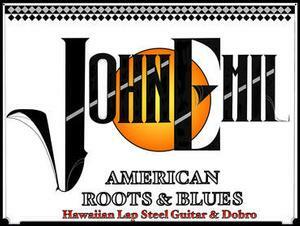 Equally adept with the acoustic Hawaiian lap steel guitar and Dobro, Emil first appeared on the South Florida music scene in 2000. Fans hear haunting, subtle hints of Delta bluesmen Son House and Blind Willie Johnson, but Emil ultimately creates a unique style all his own by integrating country blues, folk, bluegrass and lush Hawaiian sounds into his repertoire.